A generic wind farm with a 33 kV collection grid is compared to a wind farm with a 66 kV collection grid in Powerfactory. As the collection grid voltage is different in the 33 kV and the 66 kV wind farm the same wind turbine transformer cannot be used as the high voltage level of the transformer will be different. To be able to make a good comparison between the two wind farms, it has been decided to use the 33 kV wind farm’s wind turbine transformer as base component and only change the high voltage level of the transformer in the 66 kV wind farm. 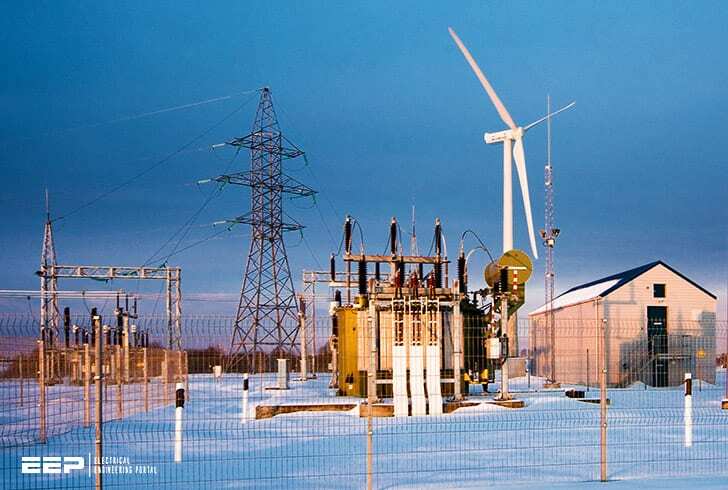 The 33 kV wind farm is built in Powerfactory using standardized components based on an existing project library provided by Siemens Wind Power. The 66 kV wind farm is a modified version of the 33 kV wind farm where the size of cables, the wind turbine transformers and substation transformers are changed to fit the 66 kV level in the collection grid. Hence, both wind farms have the same layout which is shown in Figure 1. All the wind turbines consist of a generator, filters and a transformer. An example of a wind turbine is shown in Figure 2 representing wind turbine AA01. The layout of the wind farms, in terms of number of wind turbines in an array, number of turbines connected to each substation and the length of the cables, has been predetermined using a standardized model provided by Siemens Wind Power. It is therefore assumed that this layout is a well representative model of a real offshore wind farm. Figure 2 – Layout of wind turbine AA01 in Powerfactory. All wind turbines in the model are designed in a similar way. 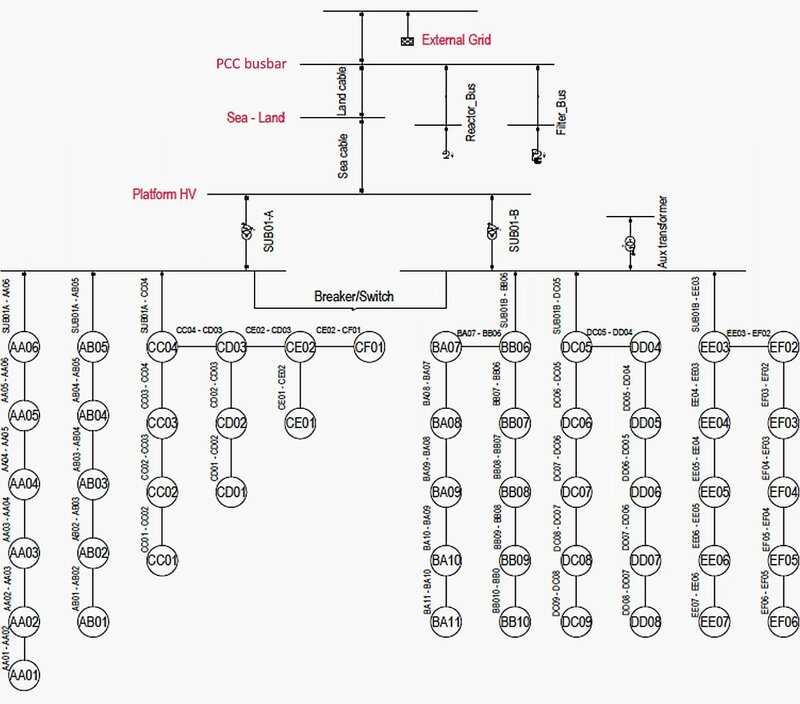 The point of common coupling (PCC), the location where the public network is entered, is chosen to be after the sea cable and land cable at the PCC busbar. At PCC the results of all load flow simulations carried out are recorded as generally up until PCC the wind farm operators are accountable for the losses and only the power delivered after PCC is paid for. The overall specifications of the two wind farms are summaries in Table 1. The wind turbines modeled in Powerfactory consist of a static generator connected to a turbine transformer and a harmonic filter. The wind turbines modeled are the Siemens 3.6 MW. It is equipped with a full-size converter, which control the behaviour of the wind turbine as seen from the grid side, and can therefore be modeled as a static generator in Powerfactory. The wind turbine has an apparent power of 4 MVA with a power factor of 0.9. The turbines are modeled with PV control and the capability curve of the Siemens 3.6 MW turbine have been specified in the Powerfactory model. For the simulations conducted in Powerfactory, the harmonic filters are only of interest in term of their active and reactive power consumption. When running a load flow, the turbine filters produce 0.08 MVAr reactive power, hence, affecting the reactive power capability of the wind farm and consume 0.4 kW of active power. A harmonic filter is also connected at the point of common coupling. This harmonic filter consumes 1.4 MW, hence, increasing the active power loss while it produce 27 MVAr reactive power also affecting the reactive power capability of the wind farm. As the harmonic filters will affect the results of the simulations, they are kept as components in the wind farm and the exact same harmonic filters used in the 33 kV wind farm are duplicated into the 66 kV wind farm. Need more information for domestic use of wind turbine like farm houses and small villages near the sea.